THE open season on journalists shows no sign of abating. And why should it, when there is no semblance of a credible investigation against the perpetrators, and when a supine government has surrendered its duty to protect the fourth estate? On Thursday evening, Ahmed Noorani, a senior journalist at The News, fell victim to a savage attack in Islamabad by six men on motorbikes who dragged him out of his car, beat him badly and stabbed him in the head. After the vicious assault, they made off on their motorbikes, none of which bore a number plate. It was only good fortune that Mr Noorani survived the vicious assault that has landed him in hospital. The situation for the media in Pakistan, never very amenable, is rapidly becoming intolerable. Journalists, and, for that matter, bloggers who ‘breach’ the ‘red’ lines decided by the powers that be are in clear danger. Several have been picked up and forcibly disappeared for weeks, even years as the example of the recently returned Zeenat Shahzadi illustrates. Some have been killed for delving into matters the state would rather keep a lid on. Saleem Shahzad, who was investigating the infiltration of Al Qaeda elements into the navy, was kidnapped and murdered in 2011. Irshad Mastoi wrote about enforced disappearances in Balochistan; he was gunned down in the heart of Quetta in 2014. Only in the case of two murdered Pakistani journalists — Wali Khan Babar and Iqbal Khattak — has anyone been held to account. Sometimes not writing about something is equally dangerous. 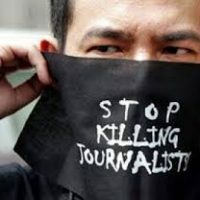 Separatist Baloch groups have also recently levelled threats of violence against journalists, which has exacerbated the already perilous environment for media persons in Balochistan. It is for the government to say enough is enough, discard its pusillanimous strategy of empty condemnations, and take substantive steps to end the assault on press freedom. No one, absolutely no one, should have the carte blanche to intimidate journalists with such impunity.